Air quality is one of the basic needs to create a healthy indoor environment in both dwellings and offices. A good water balance is essential for the health of both buildings and its occupants. In order to get rid of smells, moisture and harmful substances, ventilation with fresh air is the required strategy to avoid moulding and allergies. Building Profiles offers a complete range of window ventilation products. In order to provide higher levels of ventilation, whilst not compromising the structural strength of a casement window, the overglass or glazed in ventilators have become very popular. These ventilators are bespoke - made to order and available in most standard RAL finishes. DucoPlus 45 A "controllable" aluminium glazed-in window ventilator featuring a smoothly curved canopy for superior weatherability and postive action inner 'tip' which directs the flow of incoming air upwards. 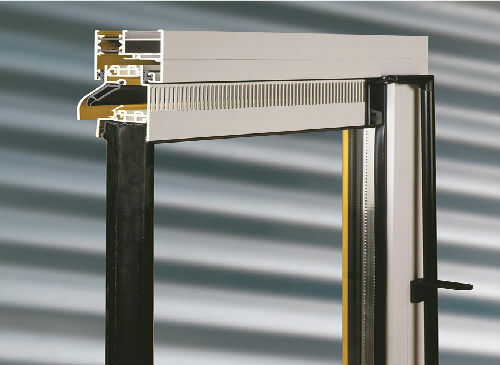 This slim-line ventilator requires only 45mm glass reduction but provides 15000mm² free area/metre of ventilation. DucoPlus 60 A "controllable" and thermally broken aluminium glazed-in window ventilator featuring a smooth external design with an internal "air deflector" directing the incomings air upwards, thus avoiding draughts. Duco products, Europe’s leading ventilator specialist, supplied direct to us to fabricate ventilators to your size specification.